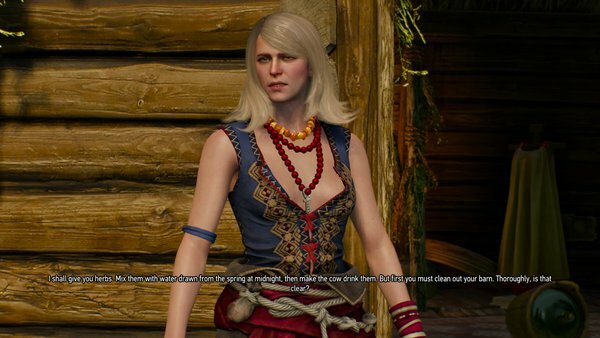 - To trigger this quest you need to complete The Nilfgaardian Connection. Reading the ledger at the end of that quest will trigger this quest, as well as another, Bloody Baron. You can complete either of them first. We’ll start with Hunting a Witch, since it’s slightly easier. - Head to Midcopse. You don’t have to do this, if you already know how to find the witch, but Midcopse has info you may find handy for tracking her down. You’ll find Midcopse two towns south of Heatherton, past Blackbough. Aside from some mounted Bandits you probably won’t run into any trouble along the way. - Midcopse has the usual oddments - items, armour, a Notice Board - but your main focus here should be a pair of gossiping women. They’re by a house on the western edge of town, and they’ll talk about a witch… but only if they don’t think they’re being overhead. You need to get close enough that you hear them without approaching too close. As soon as you hear them, stop in your tracks, wait for them to chat out the directions, and head on your way. If you screw this up you’ll have to find the witch on your own. - Now for the directions. Start by heading north out of the village. There’s a pond here. Once there, look for a lone boulder. It’s along the path beside the pond. Take a right at the boulder (east) and continue down the path; you’ll find the abandoned cart nearby, guarded by several Nekkers. Kill them off. - The witch’s hut is nearby. Watch the cut scene out front, then follow her into her house. She disappears on you. Use your Witcher Senses to canvas the house - you can find some decent items, particularly in the cellar in her room, accessible via a trap door - but the primary item you’re looking for is a skull, sitting in the rear of the house. Touch it to activate a portal. Hop inside. - Nice place. The witch, Keira, is waiting for you upstairs. After a lengthy chat she’ll invite you along for a trip. This will complete the quest and trigger another, Wandering in the Dark.